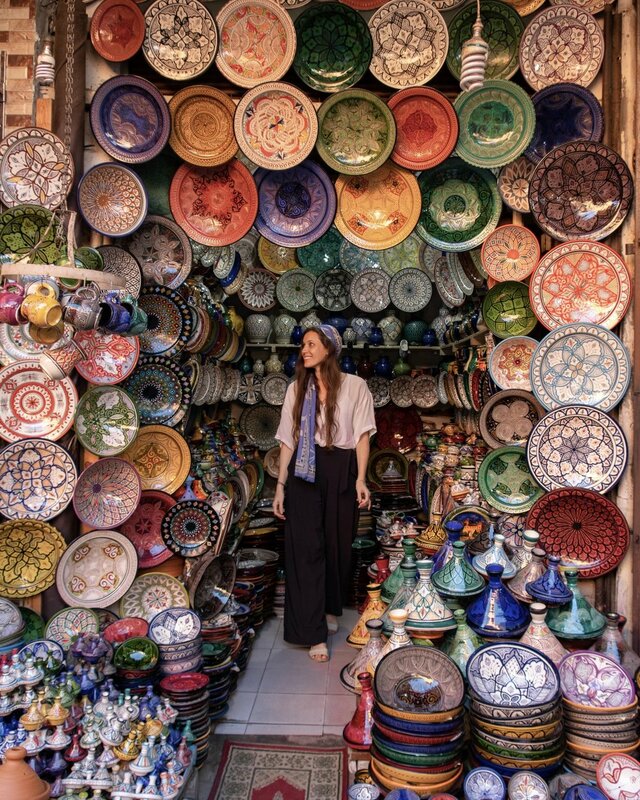 Marrakech is a popular travel destination for many reasons: rich culture, an exotic landscape, tasty food, great souk shopping, and it’s only a quick 2-hour flight from Spain. But if you ask multiple female travelers about their experiences in Marrakech, you will likely have very mixed reactions. Having been twice myself, both trips felt completely different in that I hated it the first time and loved it the second time. A traveler’s unique experience can be shaped by many things: expectations, comfort level, prior experiences, tolerance to aggressive sales tactics, mood, etc. Whether she is traveling alone, with girl-friends, or with male friends or a boyfriend/husband can also influence the experience, as I learned first-hand. The first time I visited Marrakech and Morocco, I was alone for several days and then joined a group tour. The time I spent alone there left me with a not-so-great impression of Marrakesh, as you can read in more detail here. I was brought to Marrakech again two years later to speak at the Trablin International Summit, and thankfully was able to travel with my boyfriend, who allowed me to see Marrakech in a new light. Together we could walk throughout the medina without me feeling vulnerable, and not once was I harassed or made to feel uncomfortable while I was with him. I would like to think that maybe the way locals approach female travelers in Marrakech had changed so drastically in the two years in between my first and second visit, but I think it’s more obvious that having a male companion to travel with is really what made all the difference. Regardless, I was able to appreciate Marrakech in ways that I didn’t get to do while traveling alone on my first visit: by strolling through the medina, wandering through its alleyways, and exploring the famous souk. Exploring the souk in Marrakech and shopping for local items was always the biggest draw for me. But after feeling too rushed and intimidated on my first trip to enjoy shopping and taking photos, I’m happy to say that after my second trip to Marrakech I was feeling like I knew the alleyways like the back of my hand. Something I would have really found useful on that first trip was some sort of sense of direction, or destination in mind to help me navigate the souk- so here I’m sharing the exact geo-locations of my three favorite shops (that also make great spots for photos!). Straw bags in the Marrakech Souk. I chose the one I’m Holding here and purchased another as a gift for my sister. At this shop I had a difficult time choosing just two bags to take home- I wanted them all! The shop owner at this stall was so friendly, and after always gave me a big smile and a wave every time I walked past his shop during the course of my stay in Marrakech. Lantern Shop in the Marrakech Souk. I bought tea glasses here, I was hooked on mint tea after my trip to morocco! This shop is located right at one of the main entrances to the souk, so foot traffic can be pretty heavy. We were able to snap this quick photo during a split-second break in the crowd. I chose a matching set of blue painted ceramic bowls for my apartment. The shop owner was so kind and helped me find two bowls with the same pattern. The display at this shop is so inviting, its practically asking you to take a photo! Sadly while I was here shopping, I noticed several other travelers take photos of this beautiful shop without even acknowledging the owner or buying anything. One thing I love to point out about taking photos in market stalls or in shops is to think about why that shop is there in the first place. The shop owner is there to make a living and to offer local products to the rest of the world. Always ask for permission when taking a photo, and if you want to know the secret to getting a yes: it’s simple- just buy something! And you will have a nice souvenir to go along with your photo. Don’t forget to also be respectful of other shoppers and potential sales the shop owner would like to make. To read more about this topic and other tips to help you improve your travel photography, click here. Can’t wait to start shopping? Visit The Little Market (www.thelittlemarket.com) from the comfort of your own home to browse handmade items and accessories made by women from all over the world, including Morocco. The description of each item will tell you where it comes from and which local community you will be benefiting! Have you been to Marrakech? Were you alone, with friends, or with a partner? Tell me about your experience in the comments!